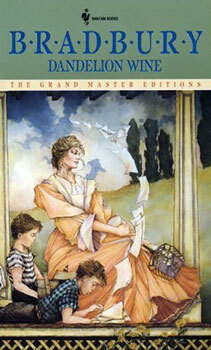 Dandelion Wine – Chapters Twenty-three and Twenty-four - Jimmie Aaron Kepler, Ed.D. The potion, however, does not stop her from continuing to knock things over, and she in fact begins to feel strangely disoriented as she talks on the platform. Elmira loses the election yet again to Clara, who then draws from her purse a voodoo doll with several tacks embedded in it. A dazed Elmira asks Tom to show her the way to the restroom, but she makes a wrong turn and tumbles down a flight of stairs. Miraculously, she has no broken bones despite heavy bruises, and Clara apologizes to her and even offers a second vote to elect her as president. The story ends with all the women running up the stairs, laughing and crying at the same time. It is left unclear on whether Elmira’s fall was caused by mental disorder, nausea after drinking her “potion,” or real witchcraft by Clara. Another one-page chapter shows Tom telling Douglas about his weird encounter with the ladies at the lodge, and they comment on how the town is full of magic, illustrating how kids view events differently than grown-ups do.